During short periods of years of Ukrainian independence the “Ukrainian-Russian Question” was considered in both countries so dramatically that it seems like this question took a place of the notorious “Jewish Question”. Relations between two independent countries sometimes looked like Soviet-American “cold war” in the past, or like good neighbours’ friendship of the time of the “socialist camp” and the Council of Economic Assistance. Surely, neither former, nor latter type is acceptable for international affairs of two countries, which permanently emphasise their commitment to ideals of democracy and intention to join European community. However brief chronology of development of Ukrainian-Russian affairs proves that their relations become closer and more various. December 5, Moscow. The Russian Federation recognised Ukraine as an independent state. February 14, Moscow. Diplomatic relations between Ukraine and the Russian Federation was established. June 23, Dagomys, Russia. Agreement on further development of interstate relations between Ukraine and Russia was signed. October 22, Moscow. Governmental agreement on trade was signed. June 24, Kyiv. A range of governmental agreements, including those on free trade and on cooperation in oil and gas industries, was signed. June 28, Kharkiv, Ukraine. Agreement on base for economic, scientific and technological, and cultural cooperation of Ukrainian and Russian trans-border regions was signed. November 17, Moscow. Agreement of governments of the Russian Federation and Ukraine on cooperation of enterprises of military industrial complex was signed. January 14, Moscow. Presidents of Ukraine, Russia and the USA signed trilateral declaration on problem of nuclear weapons, the USA and Russia provided Ukraine with guarantees of nuclear security. February 8, Kyiv. Agreement on friendship, cooperation and partnership between Ukraine and the Russian Federation was initialised. Several governmental agreements, including that on realisation free trade regime, were signed. March 20, Moscow. The first meeting of joint governmental Ukrainian-Russian commission on cooperation. May 31, Kyiv. Presidents of Ukraine and Russia signed Agreement on friendship, cooperation and partnership between Ukraine and the Russian Federation. February 26 – March 1, Moscow. Presidents of Ukraine and Russia signed Agreement on economic cooperation for years 1998-2007. December 25, Moscow. The State Duma of Russia ratified Agreement on friendship, cooperation and partnership between Ukraine and the Russian Federation. June 30, Kyiv. The Verkhovna Rada of Ukraine ratified Agreement on economic cooperation for years 1998-2007. December 22, Moscow. Governmental agreement on conditions for natural gas transit via territory of Ukraine was signed. May 21, Moscow. Victor Chernomyrdin was appointed as the ambassador to Ukraine with status of the Special representative of the president of Russia for development of trade and economic links with Ukraine. June 10, Pavlovsk, Russia. Accord on establishing a consortium for natural gas transportation was reached on talks of presidents of Ukraine, Russia and chancellor of Germany. August 16, Moscow. Russian Gazprom and Oil & Gas of Ukraine signed the contract for realisation of Ukrainian-Russian governmental agreement on long-term supply of Russian natural gas to Ukraine and its transit via Ukraine’s territory. October 7, Moscow. Governmental Agreement on strategic cooperation in sphere of energy was signed. January 15-17, Kyiv. The first meeting of Inter-parliamentary commission on cooperation. January 28, Kyiv. Presidents of Russia and Ukraine signed Agreement on state border (concerning its land part). February 5, Moscow. Russian Gazprom and Oil & Gas of Ukraine registered International Gas Consortium for transit of Russian natural gas to Europe. February 23, Moscow. Presidents of Ukraine, Russia, Belarus and Kazakhstan made Declaration on economic integration (further – the EEP project). December 24, Kerch, Ukraine. Presidents of Ukraine and Russia signed Agreement on cooperation in use of the Sea of Azov and Kerch Strait, and gave Common charge to governments concerning establishing the EEP. March 31, Kyiv. Government of Ukraine approved minutes on confirmation with Russia of staged abolishing exclusions from free trade regime. April 20, Kyiv and Moscow. Parliaments of Ukraine and Russia made synchronous ratification Agreement on establishing the Single Economic Area (the EEP), Agreement on cooperation in use of the Sea of Azov and Kerch Strait and Agreement on state border. July 2, Moscow. Government of Russia approved minutes on confirmation with Ukraine of staged abolishing exclusions from free trade regime. July 26, Crimea, Ukraine. Presidents of Ukraine and Russia discussed issues of the EEP, cooperation in machine-building, aircraft production, metallurgy and energy sectors with representatives of large business of both countries (so-called “oligarchs”). August 5, Moscow. The State Duma of Russia abolished collecting VAT (18%) for export of oil and gas from Russia to Ukraine from January 1, 2005. August 6, Kyiv. Ukrainian government approved resolution on final coverage of old debts for Russian natural gas ($1,43 billion, in a kind of partial refund transit costs for Gazprom). August 18, Sochi, Russia. Governmental agreements on measures for provision of strategic cooperation in natural gas industry (for unified work of Russian and Ukrainian gas transportation systems) and transit of oil via territory of Ukraine (for 15 years) were signed. September 10, Moscow. Governmental Concept of integration of transport systems of the states (also including development of international transport routs) was signed. January 24, Moscow. Economic partnership was confirmed during the first foreign visit of newly elected Ukrainian president Victor Yushchenko to Russia. Leaving alone military sphere of Russo-Ukrainian affairs (Russian bases in Crimea, setting borderline through area of water of the Sea of Azov, let us concentrate on economic factors of relations of these two states. We start from several issues, which have already become in somewhat mythological. Issue 1: Ukraine will never be able to provide independent politics because of its energy dependence upon Russia. That myth was born and grown up in Russian political circles and Russian mass media, where it was strongly and permanently stimulated afterwards. As a matter of fact, many European countries, including those, which now belong to the European Union, are in greater or even sometimes total dependence on Russian energy commodities supplies. In order to illustrate that statement, we can give some detailed date on shares of Russian crude oil and natural gas in energy balances of selected countries. However, discussions about complete energy and hence economic dependences on Russia had become not important a long time ago - so most of experts do not consider it worth of serious analysis nowadays. Yes, indeed Ukraine has not made any serious effort to diversify its oil and gas supply sources yet. However Ukraine’s dependence on supply of energy commodities from Russia did not grow significantly in a long run - if to compare data pre-default year 1998 and more recent ones (2003), it is clearly seen that Russia’s share in energy commodities imports to Ukraine remained relatively constant and in a range 61%-69% in 2002-2003. Main reason for temporary decrease of supply, was Russian politics towards Ukraine, first of all price policy. In late 1990s and beginning of 2000s Russia used its energy monopoly to make Ukraine’s foreign and domestic politics dependent. The monopoly was used in two ways: either with restricting supply of commodities, or with setting higher prices for them. Argument for new pricing was reaching the world or the EU price levels. But restrictions of oil and gas supply volumes hit profits of not only Ukrainian oligarchs but also their Russian vis-?-vis and therefore made opportunities for their mutual and often done behind state regulations affairs narrower. That is why supply volumes as a rule were renewed after several rounds of talks. As for increase of oil and gas costs for Ukrainian economy, it should be marked that this process stimulated yet another one: installment of energy saving technologies. Due to it Ukrainian production becomes more competitive and in terms of competitiveness of Ukrainian production and goods further gradual reaching the EU price level by Russian energy commodities should be treated as positive. Fears of instant cease of the most of Russian crude oil supplies to Ukraine are groundless: the most of Ukrainian oil refineries are in complete or partial property of Russian private corporations or even structures with governmental shares. That is why such a cease would hit leaders of Russian business and moreover their foreign trade contracts since oil products from their Ukrainian refineries can often be sold abroad. The same concerns oil and gas transit to Europe. Stable supply of these commodities is in interest of many Western and Central European countries. Some large European companies either buy shares of Gazprom and, if possible, Russian oil companies, or set up joint ventures with them. The key condition of the stable supply is normal work of the Ukrainian gas and oil transportation systems. Besides, stable gas supply to Europe depends on working conditions and accessibility of Ukrainian underground reservoirs. These reservoirs are unique by their capacities and sizes. The fact of lack of such reservoirs (and, because of geological and other natural requirements impossibility to construct them) in other transit countries sharply decline risks of new gas routs to Europe. The other barrier to constructing new both powerful and long Russian-European gas pipelines is high construction costs. It is very hard for Russia to finance such costs alone. All that in total makes volumes of Ukraine’s transportation services for Russia stable, despite problems, which appear in their relations from time to time. Besides, it should be noted, that after the opposition to Mr Kuchma took power, chances for diversification for supplies of energy sources become more real. First of all that concerns work of the Odessa-Brody oil pipeline in the initially planned direction. Actually, relative increase of Ukrainian services for Russia, including transportation (other than energy transit), have started since 2000. Therefore share of Russian energy transit by Ukrainian pipeline network in Ukrainian exports of services decreases. All that support a suggestion that economic relations between the two countries become now not only more developed, but also more diversified. Mutual respect to sovereignty will only stimulate growth of mutual trade volumes and diversification. Finally, specific and increasing role of Turkmenistan in natural gas supplies to Ukraine should be underlined. Surely, now Turkmenistan is obliged to use Russian services, being not always welcomed when supplying its natural gas exports to European direction. With appearance of real alternative to deliver gas to not only Ukraine but also further westward, attitude of Turkmenbashi’s country may change a lot. One of the shortest routs between Turkmenistan and Europe is that via Ukraine and it could heavily change current situation with sources of gas supply to Ukraine and then all its gas transportation system. This issued is rooted from the soviet era, when all the soviet republics were linked with each other by network of numerous economic and political links. Those were days when it was hardly possible just to imagine that a single republic detached from “common body” can exist independently and survive. However possibility for that was proved with further events. Moreover they also proved that it is not too terrible when a republic is taken away by a kind of “surgical operation” and the Baltic republics are a good example. Today, after more a dozen years since that time, needs of everyday life make all former soviet republics to maintain more or less independent economic policy. Many former liaisons do not look as necessary as before, while new ones become more pragmatic and therefore not always indisputable and binding. To put it more precisely, new types of economic cooperation appears and they are more beneficial comparing with old soviet-type division of labour. New economic relations do not necessarily mean old ones are forgotten, but economic pragmatism just displaces ideology background. Dynamics of trade between Ukraine and Russia serves as a nice illustration for that. 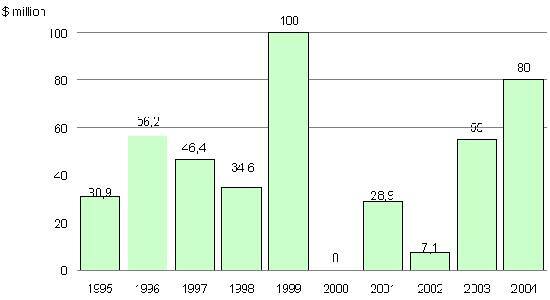 Amount of such “blood for economy” started declining after crisis of 1998 (when Ukraine suffered easier than Russia), then after revival of economy and hence demand for fuels, volumes of imports of natural gas, crude oil and oil products to Ukraine started gradually growing. Beside that, it was not the single direction traffic, as if only Ukraine depends on Russian supplies. 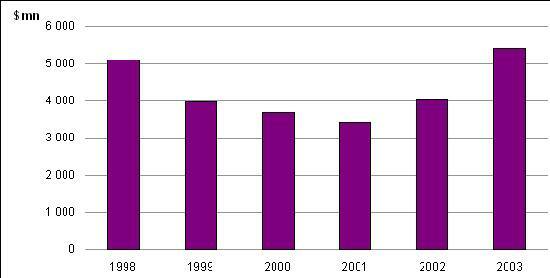 In fact, export volumes of main Ukrainian commodities also grew. Variations of trade volumes in early 2001-2003 were connected first of all with Russian anti-dumping measures rather than with pure economic reasons. Summing up, it is possible to state that now neither Russia, nor Ukraine is in status of such dependence on each other, when any side could compel or blackmail another. On the contrary, from economic point of view economic relations of both countries become more harmonious rather than built on economic or political voluntarism. Concept of the Single Economic Area (or, in more accepted acronym, EEP) first appeared in Moscow. Creation of the EEP was initiated by Russia. The key idea of the EEP was establishing suprastate bodies and the single customs area for all member states, with perspectives of closer suprastate union. Ukrainian political circles did not accept such an approach to this concept even during Leonid Kuchma’s presidency. The Ukrainian parliament, Verkhovna Rada, being then under heavy political pressure by the president Kuchma, did not however agree with such ideas of the Agreement on the EEP and, when ratified the agreement, managed to pass serious amendments, which restricted them. New Ukrainian administration naturally continues Ukrainian political circles’ attitude to see the EEP no more than free-trade zone. Namely the free-trade zone is a tactical target for political and economic elite. That is why efforts of new Ukrainian government will be directed to real and fast establishing of most of all free-trade zone in the EEP framework, while euro-integration is a strategic target. Another question - is it suitable for real Russia’s desires, will it support merely laissez-faire trade and to forget about plans of transformation of the EEP into a kind of new USSR? Taking into account neo-imperial political doctrine of Russia, such a support should hardly be awaited. Most probably Russian diplomatic efforts will be used for imitation of making now exiting free-trade zone really free, while pressure for creation of customs union and suprastate structures within the EEP may continue. As a result, Ukrainian and Russian approaches in shaping the EEP will not coincide and both countries will not reach their real targets soon – if ever. Namely such conflict of interests, not Ukraine’s plans, will be crucial factor in further Ukrainian cooperation with other EEP member states. This issue is in general raised more often in Ukraine than in Russia. There, in Moscow, it could be remembered exclusively in context of suggestions that Ukraine is going to “make Russia dependent on its plans”. Frankly, considerations of this issue in both countries are rather weird but there is nothing to do with that: such attitudes exist and remind of their existence from time to time. Let us investigate this issue on the example of inflow of Russian investments to Ukraine. First, a fact of lack of proper conditions for attraction of foreign investments in volumes that Ukraine really needs, just because of political reasons, should be taken into account. That is why Ukraine is far behind its all the western neighbours by foreign direct investments (FDI), having now just $177 of FDI per capita. Quite probably, the situation is going to change soon. However Russia was one of major investing countries in Ukraine, mostly not with FDI from Russia itself, but with inland re-investing of private investors. Volumes of officially registered FDI from Russia, shown on the graph, differ too much from volumes of all Russian investments (FDI from Russia plus FDI from the third countries, re-investments from profits earned in Ukraine, loans). Taking into account only large investment projects of Russian business in Ukraine we can estimate sums of FDI and other investments with Russian roots as around $180 million for 2002, over $520 million for 2003 and around $1billion for 2004. Already declared by Russian companies, operating in Ukraine or planning to enter Ukrainian market, allow us stating that annual level of $1billion is quite credible estimation of Russian business investments in Ukraine. Manufacturing industries and services dominates in structure of officially defined FDI from Russia to Ukraine. Oil processing got almost a third of FDI, by less than a tenth came to transport and telecommunications and to financial services; construction, retail trade, metallurgy and other industries have got by several percents. Our more realistic estimations based on assessment of the top forty Russian investment projects in Ukraine for both 2003 and 2004 let us estimate in average shares of current Russian investing as following: around 30% in oil processing and chemical industry, up to quarter in telecommunications and high technologies, up to a fifth in construction and real estate, by 5% - 6% in metallurgy and machine-building, by 3% - 4% in food processing, retail and wholesale trade, transport and financial services. Already made and declared plans in 2005 support these tendencies. So larger shares amid investments belong to oil processing and other manufacturing industries, but not to extraction of raw materials, what usually characterises attitude of the centre of empire to its colony. Even people with big imagination could hardly suggest that Russian entrepreneurs, being scared of any domestic reasons, take their capitals from Russia and then hide them in Ukraine. Environment in Ukraine is not and would not favour that. 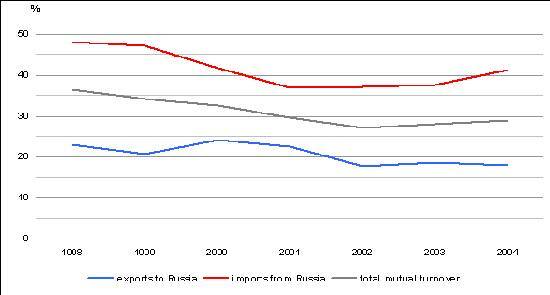 Import of Russian capitals is based just on economic necessity of such an operation and its economic gains. From 5% to 10% (vary by years) of industrial output and almost a third of telecommunication services sales in Ukraine are produced by assets of a dozen large Russian business groups. Less than 3% of Ukraine’s banks capital belongs to large Russian banks. Russian share in other financial services as well as in construction, retail, transport and agriculture is even less. However now, after 2004 Russian investors started massively investing into those industries, increase of “Russian shares” there may be envisaged. In general, we may state that the “Russian share” in Ukrainian economy correlates with industrial production and can be estimated as average in a range 5% - 10%. With the current GDP structure, Russian capital in Ukraine produces up to 8% of Ukraine’s GDP in 2004. With given structure of exports, all Ukrainian-Russian economic relations may contribute up to a sixth to all GDP. Several large Russian business groups – but not all of them! – have actively worked in Ukraine for a decade: Lukoil (oil), Alfa Group (finance, telecommunications, oil, pharmacy), a group based on assets of the Russian Aluminium (Base Element, alumina production) and Gazprom (gas, chemical products). Some, like Group Alliance (oil, machine building) and Wimm-Bill-Dann (foodstuffs) came a few years ago and some are newcomers, like Inteco (construction and building materials), Sistema (telecommunications and hi-tech), SUAL Holding (non-ferrous metals). Besides some groups which also have some old Ukrainan links like Smart Group (ores and ferrous metallurgy). Groups like Energy Standard (electricity, metallurgy and machine-building) have old Ukrainian connections. Finally, there are some smaller groups, which originated after split of assets, like NRB Group (finance, real estate and aviation), which previously was controlled by Gazprom); Capital (finance and mass media) was controlled by Lukoil before; Planeta (dairy products) was close to Russian Aluminium) and Itera (gas, chemical production, real estate), which was in sphere of Gazprom). It is possible to classify large Russian business groups working in Ukraine by annual turnover of Ukrainian industrial assets that belong to them. Russian Aluminium and companies close to it (around $150 million, whilst $270 million in 2002). Besides, Group Alliance, which had annual turnover in Ukraine about $400 million in 2002, but sharply decreased in 2003, can sometimes be added to such leaders. Inteco (around $20 million in 2003, construction services not included). Newcomers are specialists: Sistema in telecommunications and high-tech, Inteco in construction and Smart Group in metallurgy. The former two are targeted to highly growing value added industries and both are close to Moscow mayor Yury Luzhkov. Such newcomers actively invest and buy assets in Ukraine. They do it while the “old” (for Ukraine) Russian groups tend to sell assets out of their specialisation: Russian Aluminiumv sells real estates, Lukoil is to sell transport. The largest seller is Alfa Group: in addition to (global) selling some shares in oil processing (TNK), it got rid of its Ukrainian media assets and think of selling share in fixed line communication company Golden Telecom. Turnover of other Russian business groups production in Ukraine is as a rule smaller, but some of them can play vital role in transit services and imports (like Gazprom and formerly Itera) or investment distribution (like NRB Group). Besides some business groups, like Energy Standard or the “group of shareholders of TsSKA Football Club” always tried to hide their activities, so it is hardly possible to correctly assign their real turnover in Ukraine. We should note, that links of large Ukrainian and Russian business groups remain, like those between: Interpipe with SUAL Holding, Alfa Group and Energy Standard; Ukrsibbank with a group based on Russian Aluminium; Ukrsotsbank with its Russian partners. However, in issues of privatisation the Russian and Ukrainian business groups are strong competitors. One of the recent examples was pushing Russian investors out of privatisation tender for the largest metallurgy plant, Krivorizhstal, which was bought by Ukrainian groups – despite they offered much less (now this sale is under governmental investigation). In general, Russian participation in Ukrainian privatisation was weak, but those companies with Russian business groups managed to acquire (like UMC, ZALK, Mykolayiv Alumina Plant) are very profitable. Some rare cases are entering Ukrainian market via the third countries (e.g., privatisation of 4 electricity distribution companies the Russian side did formally through Slovak company VSE). Whatsoever, sales turnover of the largest Russian business groups in Ukraine decreases, from up to 8% of all Ukraine’s industrial output in 2001-2002 to just 4% in 2003. But we envisage that thanks to newcomers and more active smaller groups the overall “Russian share” in Ukrainian industry will be stable, up to 10%. Yes, the “Russian share” is much more than any other foreign one, but being not even “blocking share” (a quarter) it is not critical for the economy. In short, presence of Russian investors, including business groups, in Ukrainian economy is too exaggerated. No formal structured Russian business lobby like actively acting in Ukraine the American Chamber of Commerce or the European Business Association exists in Ukraine. However there is a project to set up the Russian-Ukrainian Business Council by the Business Russia (Delovaya Rossiya), one of the largest Russian business associations, and by Council of Entrepreneurs for Ukrainian government. Surely, there are bilateral coordination bodies like Ukrainian-Russian governmental and parliamentary commissions (the latter has become more active thanks to efforts of parliament speaker Volodymyr Lytvyn). Also there are bilateral permanent working contacts between Russian Union of Industrialists and Entrepreneurs (RSSP, often called as “oligarchs’ club”) and Ukrainian Union of Industrialists and Entrepreneurs (USSP, uniting mostly the so-called “red directorate” and headed by new the first vice prime minister Anatoly Kinakh). There are some political parties and organisations that now fight for “Yanukovich’s heritage”, over 44% voters who supported him during the last term of the last elections and who are often in favour of closed ties with Russia. Amid such political players we may outline represented in parliament the Social Democrat Party of Ukraine (united) , the Party of Regions (formally party of Victor Yanukovich), and, of course, the Communist Party of Ukraine. They are often represented as a backbone of future opposition to new president Victor Yushchenko. There is also small centrist party (and parliamentary fraction) the Union (Soyuz) and some MPs from former fraction Labour Ukraine, which are for closer co-operation with Russia, but have no intention to be a kind of opposition. These pro-Russian (often quite formally) parties possess a third of seats in parliament. Besides there is the Socialist Party of Ukraine, also represented in parliament and new government, which attitude to Russia is rather positive. Finally, there are MPs of Yushchenko’s fraction Our Ukraine that help promote some Russian businesses. Among not represented in parliament political structures which fight for “Yanukovich’s heritage” and hence positioning themselves as “Russian-friendly”, we can note such ones as the State (Derzhava, headed by former prosecutor general Gennady Vasiliev) and New Democracy (headed by former Kharkiv governor Eugeny Kushnariov), which is financially supported by some business groups in respective regions (Donetsk and Kharkiv). Scandalous leaders are problems of those parties so most probably they will bloc with others for the next elections. Finally, there are some strongly pro-Russian organisations, the most known of them is Russian Bloc party, but they are popular locally - only in Crimea and in several cities outside it. Today large Russian business groups prefer to establish their own liaisons. For instance, Gazprom might act through Russian ambassador Victor Chernomyrdin, while Alfa Group can act using both relations of its Ukrainian branch and own connections in the Kremlin.